The James Family Prescott YMCA is a non-profit charitable organization that was founded locally in 1914. It is an association of persons of all ages who are united in a common effort to put Christian principles into practice through programs that build healthy spirit, mind and body for all. A community volunteer Board of Directors sets policy, gives ideas and oversees the financial decisions that govern the YMCA. The YMCA is supported by memberships, program fees and public and private contributions. 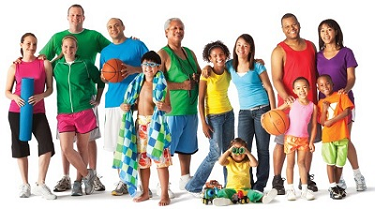 As a membership organization, the YMCA is open to everyone regardless of their ability to pay. An extensive scholarship program ensures access to kids and families who could not otherwise afford the benefits of the YMCA. Outdoor Lindquist Family Park for walking, boot camp, picnics, childcare, etc. The YMCA has been part of the Prescott community since 1914. The current facility, the James Family Prescott YMCA, was opened in 1998. The last major capital fundraising campaign for the construction of this facility began in 1995 and raised 5.5 million dollars. Since opening, membership has grown to over 10,000 members. Our YMCA has exceeded all expectations outlined in the last campaign. By Ron James ~ Ron James is a past board president of the James Family Prescott YMCA and is a strong supporter. The James Family Prescott YMCA has seen many changes since it was founded in 1914 in the Prescott community. Remember when the YMCA was a one room building on Whipple St? Remember when we campaigned ten years ago for a building to anchor all of the YMCA’s programs? Remember when you went down the slide in the new indoor pool for the first time? Yet, the YMCA is more than its buildings. It has helped launch kayakers in the Verde River. It has taught young women to balance serenely in gymnastics poses. It has sent marathon runners up and over Thumb Butte and back again. Remember when the YMCA received Olympic gymnastic athletes Nadia Comaneci, her husband Bart Conner and gold medalist swimmer Klete Keller? Remember when the Harlem Globetrotters came to visit? Children in the youth basketball league poured in to see the globetrotters spin wonders with a basketball. At this point in the YMCA’s history, at the cusp of yet another positive change, the YMCA looks back at its relationship with this community, its supporters and the many families who have grown up with the Prescott YMCA. As a non-profit institution, the YMCA has given thousands of dollars in scholarship assistance so that children may have a safe place to go after school, so that youth may develop skills in athleticism and teamwork, so that adults may feel healthy and strong. These subtle benefits have long-lasting results. People walk through the doors of the YMCA every day as they have for many years. All of this is possible because of the generosity of this community. Many people have been a part of the YMCA’s evolution. The YMCA relies on the volunteers from this community. And it relies on its supporters who give to the YMCA some of their wealth, talent and time. Please remember, each gift that you give to the YMCA today goes a long way into the future of the Prescott area. It goes to toddlers, adolescents, adults and seniors. It goes to creating space for discovery and growth, for the simple things like learning how to catch a ball. It goes to the smile from a coach when your child makes their first basketball hoop. Ten years from now when we write “remember when…,” the James Family Prescott YMCA will still be a landmark for Yavapai County’s families. The YMCA was founded in London in 1844, largely in response to the appalling social conditions brought about by the industrial revolution. The first American YMCA was founded in Boston in 1851. Ever since, YMCAs have been woven into the fabric of American life, constantly evolving to meet the needs of men, women and children everywhere. The James Family Prescott YMCA is a member of the National Council of YMCA’s. It is an independently chartered facility not associated with the Phoenix or Tucson YMCAs. There are YMCAs in more than 120 countries. James Naismith invented basketball at the YMCA in 1891. Volleyball was invented at the YMCA in 1895 by William Morgan. Collectively, YMCAs are the largest not-for-profit organizations in the nation and benefit from the leadership of more than 600,000 volunteers. Collectively, YMCAs are the largest child care providers in the United States. The James Family Prescott YMCA was incorporated on September 12, 1974. The James Family Prescott YMCA’s Girls Gymnastics Program began in 1975. The first YMCA Fitness Center opened in 1983 in the building that is currently the Gymnastics and Activity Center. The James Family Prescott YMCA Youth Basketball League started in 1986. The current YMCA facility opened in 1998. Prescott High School swim team practices and host meets in new pool, 1999. The James Family Prescott YMCA employs over 300 staff members. Dodgeball and Turkey Shoots begin 2001. Youth Volleyball League begins in 2003 along with partnering with North Star Youth Partnership on Girls & Sports Day. Girl's gymnastics team wins at YMCA Nationals, 2008. Lindquist Family Park dedicated in 2008. LIndquist Park donated and dedicated along with Pickle Ball begins in 2008. Dance department began in 2011 adding ballet, tap, jazz, hip-hop and more. Adult Flag Football and Soccer begins in 2012. Gymnastics Pit and Gaga Pit open in 2014.